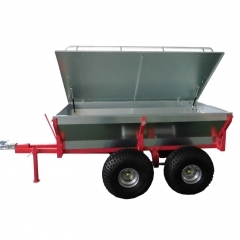 XTM ATV Dump Trailer is an Dual axle ATV Garden trailer with heavy duty but light weight, wide flotation tyres and high ground clearance making them ideal for off road use. Removable front & rear tail gate and easy central tipping base further enhance their cargo handling capability. 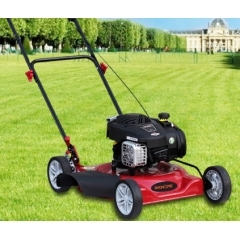 Suitable for a variety of uses including: Forestry, Farming, Garden, Equestrian, ATV&UTV tow behind. 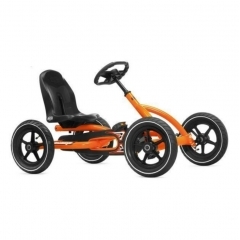 With a 800kgs load capacity on a regular/daily basis. 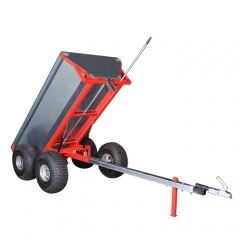 XTM OD-12 hydraulic pump tipping ATV Garden trailer with heavy duty but light weight, wide flotation tyres and high ground clearance for off road use. OD-12 special equipped with external electro-hydraulic pump, gives you a more easy tipping. 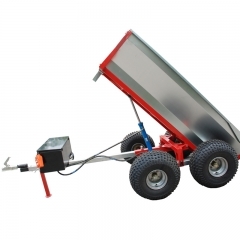 XTM OD-11 is an Dual axle ATV Garden trailer with heavy duty but light weight, wide flotation tyres and high ground clearance making them ideal for off road use. OD-11 special equipped with two gas spring, gives you a more easy tipping. Removable front & rear tail gate and easy central tipping base further enhance their cargo handling capability. 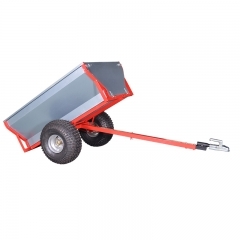 XTM OD-10 is an Dual axle ATV Garden trailer with heavy duty but light weight, wide flotation tyres and high ground clearance making them ideal for off road use. Removable front & rear tail gate and easy central tipping base further enhance their cargo handling capability. 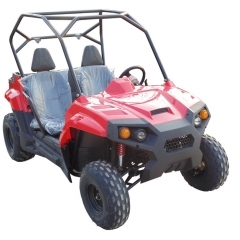 XTM OD-01 is an atv tow trailer with heavy duty but light weight, wide flotation tyres and high ground clearance making them ideal for off road use. Removable front & rear tail gate and easy central tipping base further enhance their cargo handling capability. 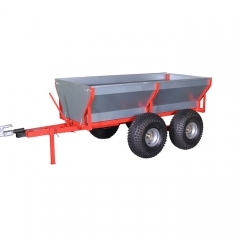 XTM OD-09 is an Dual axle ATV Garden trailer build based on OD-10 trailer with heavy duty but light weight, wide flotation tyres and high ground clearance making them ideal for off road use.